Pamela holds two consecutive law degrees from the University of Ottawa. She earned her civil law degree (LL.L) with distinction in 2014, and her common law degree (J.D) in 2015. 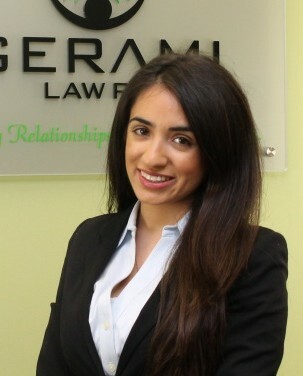 Prior to joining Gerami Law PC, Pamela gained extensive knowledge in privacy law and access to information law at the Department of Aboriginal Affairs and Northern Development Canada. During her legal studies, Pamela was a criminal law professor for the Enrichment Mini-Courses Program (EMCP) at the University of Ottawa. She has also volunteered at the Coalition for Gun Control (CGC) as well as the Canadian Centre for International Justice (CCIJ) on a high profile case for crimes against humanity. In 2014, Pamela competed at the Canadian rounds of the Philip C. Jessup International Law Moot Court Competition where she placed second best oralist. In her spare time, Pamela is an accomplished second degree black belt in Japanese jiu-jitsu. She also enjoys MMA, kickboxing and fine dining. She is fluent in French, English and Arabic.